...And our list of clients continues to grow! "Thank you for coming up with such and ingenious product"
"I would just like to say thank you for coming up with such an ingenious product. 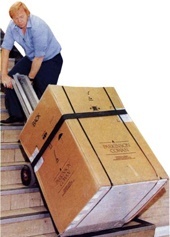 We purchased a motorized hand truck model L-1 a few years ago and it has changed the way we do business. 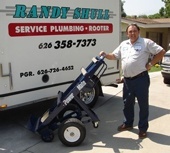 I have been able to reduce the manpower on most of our jobs because of this tool. Not only is it great from a health and safety stand point but it has also increased our profits. 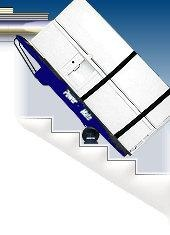 I look forward to meeting with you in the near future when we are ready to purchase another hand truck for our growing business." "We purchased your product in 1997 and it's still going strong! I've owned my business for 34 years and proud to tell that this was one of the best - if not the best - purchase that I have made for my business. I'm sure proper maintenance prolonged its life but servicing it was painless. Thank you for building an awesome product." 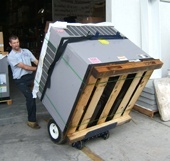 "We are a heating and air conditioning company located in eastern New York. The owner of our company was telling me that changing boilers was taking too much time. I told him that installation time could not be reduced, but the time spent removing the old equipment could. We needed 4 men to remove the old cast iron boilers. This meant taking 2 men from another job and have them help the other 2 mechanics remove the old boiler. If you add up the driving time, lost production time and boiler removal time, it was taking us an additional 6 to 8 hours to remove a boiler! 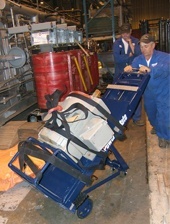 I told the owner to get us a PowerMate hand truck, then we could avoid sending two extra men to each boiler job. Business owners know that costs are fixed, but time is money! 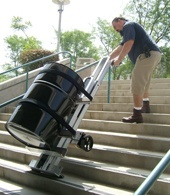 We have since bought a PowerMate M-1 stair climbing hand truck. With the time we have saved, it has only taken a few small jobs to pay for itself. 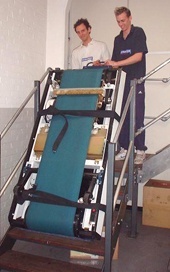 Not only that, it has greatly reduced the risk of injury to employees. We also purchased the optional big wheel attachment, which helps us move heavy equipment across lawns, driveways and parking lots. 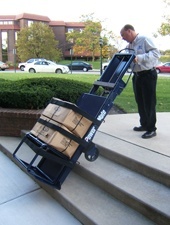 The PowerMate hand truck was one of the best investments our company has made! 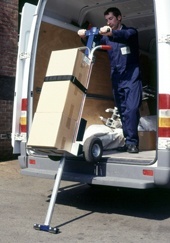 I would recommend one of these hand trucks to anyone!" I recently purchased a PowerMate L-1, and am writing this note to advise your company of how pleased I am with its performance. I had recently undergone surgery and was concerned that my small HVAC shop would suffer a loss of business while I was told not lift anything for a few months. Well after researching many options, I decided to buy the PowerMate L-1. I have had no problem placing 40 and 50 gallon water heaters downstairs in basements, and loading and unloading them from the tailgate of my delivery truck. I have placed hot water boiler systems weighing in excess of 450 lbs and furnaces of 120 lbs downstairs by myself with ease. Thanks for the Great Product!!! Cline Heating & Supply Co. I spoke to both my driver Mike Mann and his helper Brandon Lowes, about the product. training they moved two 1400 lbs safes up to a second floor location. 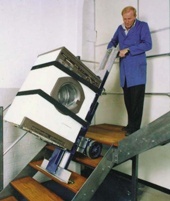 I am writing this letter to let you know how happy I am with the PowerMate stairclimbers. I bought three of these from you back about four months ago. I have them on trailers that are out of the area for five days at a time. With Christmas coming up, I am seeing an increase of safes that I am moving. 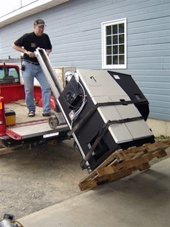 These safes weigh between 400 and 700 pounds each and a lot of the time are in areas where labor is not readily available. Because of the PowerMate, these safes are not a problem for my drivers. 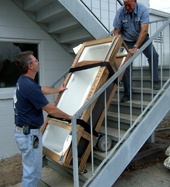 One person is able to move these safes up and down stairs safely and efficiently. 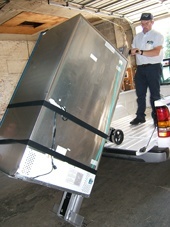 We have moved six safes in the last month. Other items we have moved using the PowerMate for are copiers, arcade machine, five huge desks up two flights of stairs and massage chairs. My labor costs have been greatly reduced because of the PowerMate. Work Smarter not Harder is my motto! We have had our PowerMate LE-1 for six years now. I still can’t get over the number of my fellow contractors that stare in amazement every time I take a boiler off the truck by myself. They even call me to help bring their boilers down the stairs for them on the tough jobs. Maybe there is a LE-1 rental market out there! Work smarter not harder is my motto and PowerMate sure helps me with that. President, Kevin M Brady Plumbing & Heating Co. Inc. I am writing this letter to document the success Jasper has seen by implementing the use of the PowerMate M-1J. 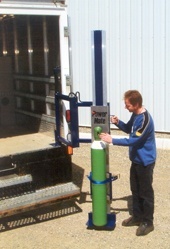 Jasper implemented the use of the PowerMates in conjunction with proper training, proper lifting techniques, new skids, ergonomic analysis and a stretching program to help our drivers make safe deliveries. Jasper has been using PowerMates for many years and has seen a direct impact on our recordable injuries and dollars spent. In some cases we have seen 50% reduction in recordables. I would recommend to anyone that they at least give PowerMate the chance to show what their product could do to help your company’s safety and health program. 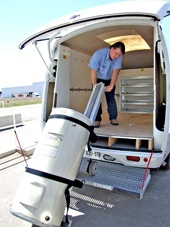 HandTrucks are the right choice for moving heavy loads. Be smart, purchase one today! Register for a FREE Profit Analysis here to find out if a PowerMate is right for your business.